When the Rector of the Parish Church was removed from his living by the 1662 Act of Uniformity he joined the the fellowship of "Brownists & Seperatists" [forerunners of the Independents, now known as the Congregationalists] existing in the village. The first Meeting House was established within the next few years. Nothing further is known until 1719 when Rev. Richard Adey arrived. He was the first of four consecutive ministers who were masters of the Free School endowed by John Mayo. This charity still exists and is used for children going on to further education. Opposition from the High Church Party in the village made nonconformity a struggle in the 1700's, and by 1800 the congregation and membership was very small. By the efforts of Miss Counsell of Bristol [of a Kingswood family] and Rev. John Lewis of neighbouring Wotton Under Edge the work was revived. With the coming in 1806 of Rev. Charles Daniell it went from strength from strength. 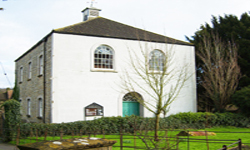 He established the Sunday School in 1809 and new galleries were added to the Meeting House, but within 10 years the "Little Sanctuary", as it was known, became too small to hold a weekly congregation and it was decided to build a bigger Chapel. Rev. Daniell purchased an adjoining piece of land for £66 and drew up plans for a building 44 x 33 feet with 3 galleries and a vestry. This building, the present Chapel, was opened in 1821 and paid for by public subscription. With a stipulation that no money be spent on the ornamentation, the total cost was £821.10.0d. It was built of local stone known as clay rags, with a slate roof since replaced with tiles, a typical Gloucestershire Nonconformist Chapel of it's time. A small clock tower still holds the face of a "four poster bedstead" clock, housed in the roof space. By 1845 there was money available to buy old cottages behind the Chapel which were pulled down to make way for a Sunday Schoolroom, which was also used as a British and then Infant School. The gardens became the graveyard. Though it is now closed and the graves levelled, the old tombstones are still in place and are largely legible. The Chapel was heated by a central stove with a vent in the roof, then with a boiler and steam pipes, replaced in 1962 with electric tubular heating. The Old Meeting House was turned into 3 cottages which were pulled down about 1905. The small plot of land is now used as the Chapel car park. The return to the Religious Census of 1851 (HO 129/333/1/1/2) describes "Kingswood Chapel" with an "Independent or Congregational" congregation, erected as a separate building, exclusively as a place of worship "before 1800". There was free seating for 250, and 200 "other" sittings. The average congregation was 230 to morning services, 121 in the afternoons, and 350 worshippers in the evenings. There were an average of 120 Sunday Scholars to morning and afternoon classes, regarding which the returning officer remarked "the Afternoon Service is held in the Schoolroom after the teaching is closed to save time & trouble in removing Children to the Chapel" He signed himself B. Osne[?] Bendall, Minister, of "Kingswood nr Wottonunderedge". Registers from about 1800 are lodged in the Gloucester Records Office.